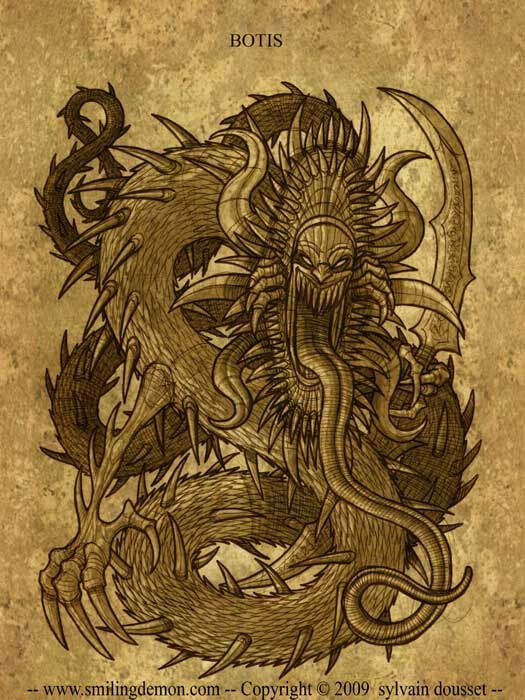 Botis, the seventeenth spirit of the Goetia, is a true warrior. With his power over 60 legions of demons, he has the ability to solve world conflicts through warfare. This is a truly dangerous character. He also has the power of telling future events, past and relevant present time events. It is said that the reconciliation of an enemy can be assured once it is commanded by Botis. Botis first appeared in a recent evocation as a large serpent near the ceiling winding slowly to the floor where it divided into two parts. Between these two serpentine parts, a human like face appeared of which two darkened holes appeared upon each side of the forehead. The serpents became a human like body and then reappeared as horns winding out from the darkened temple region holes. At this point, the conjurer said the demon opened its jaw revealing a cave with large sharp swords hanging above and falling to the floor blocking any way out. "The sensation was as if I were standing in a massive cave, with the swords hanging like stalactites and thrusting up like stalagmites from above and below. The ancients saw these things as sharp teeth in the monster's massive open mouth," the man said. "Finally, two bright white swords rise from the groin of the beast, while below them, three twin serpents wind upon white golden rods." If you search the Goetia, you will find Botis described as a viper, but upon request, this demon will take on human form with great teeth and two horns. He also carries a sword.